The Kooper-Dooper Raiser-Upper is an invention made by Kooky von Koopa. It only appears in The Adventures of Super Mario Bros. 3 episode "Up, Up, and a Koopa". It is inside the Doomship, and can shoot lasers that make everything it hits rise up to the sky. 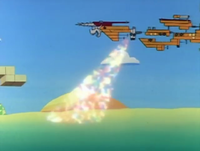 King Koopa and Kooky use its abilities to terrorize Sky Land. However, after King Koopa turns up its power, it begins to malfunction, and everything in the air begins to fall down. Kooky later repairs and upgrades it, stating that it has ten times its original power. Bowser then begins to terrorize Mushroom Land, which he conquers alongside Sky Land for a short while. Mario then takes the Raiser-Upper out of the Doomship and into Toad's floating house, and fires it in reverse on the Doomship, which sends it crashing down to Dark Land since it is already in the air. Luigi then uses it to lower everything else back to normal. This page was last edited on October 23, 2018, at 15:21.